Feature structure representations of lists are displayed in a more conventional form, using angle brackets. For this convenience to work, LUI needs to know about the list-related attributes and types (e.g. FIRST, REST, list, null, et al.) from the underlying grammar. These can be configured by means of the .luirc file; see the LuiRc pages. The AVM browser allows imploding and exploding sub-structures. Left clicking on type names (in the top left corner of each sub-AVM) will toggle the display state of that sub-structure, i.e. implode on first click and explode again subsequently. When the mouse is moved over a reentrancy tag, the tags on all other locations reentrant to that tag are highlighted, to facilitate visualization of coreferencing. Type names and reentrancy tags have contextual menus accessible by right-clicking (or control-clicking) on them. The menus allow you to perform various tasks relating to the corresponding structures. The type popup menu mostly contains accessors for information about the type. Toggles the display of information contained inside the structure whose type you click. Toggles display of hidden information inside the structure. Opens a new browser for the type subhierarchy dominated by the selected type. Opens a new browser showing the grammar's definition of the type. Opens a new browser showing the fully expanded AVM for the type. Displays the grammar source code for the type in Emacs. The reentrancy tag popup menu contains navigational helpers. Recenters the display around the next occurance of the selected tag. Recenters the display around the previous occurance of the selected tag. 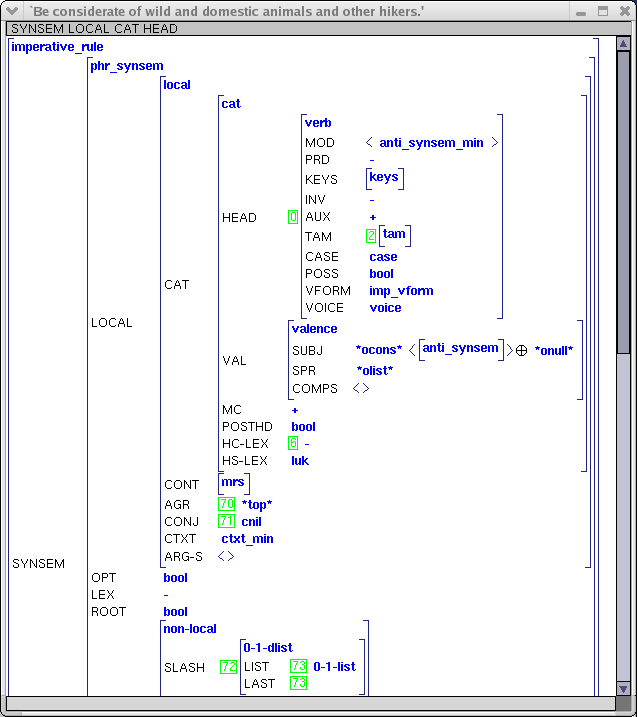 Recenters the display around the occurance of the tag which show type and substructure information. The LUI AVM browser supports interactive unification (for debugging purposes), and if the AVM being browsed contains unification failure information, then there are a few more interesting options to explore. For more information see the LuiUnification page.